A TLS simulator that will simulate clients and servers that can establish secured connection with your system under test (SUT), especially for ATNA profile. An Audit message Validation to edit Audit message specification. In mostly case, you will have to be logged in to perform actions in GSS. To do so, click on the ** Login** button (top right), and input your testing session credentials. GSS can be linked to several user databases. Whether so, there will be several login buttons. Choose the button with the title that matches the location where you are registered. The purpose of the ATNA questionnaire is to collect information regarding the implementation of the ATNA requirements in a test system. Each test system that supports the ATNA Secure Node or Secure Application actor is required to complete an ATNA questionnaire; this is the test named pre-Connectathon test 11106. Your completed questionnaire will help the testing team understand your system’s capabilities, and it will direct their evaluation of your system during the test session. The ATNA questionnaire resides in GSS, go to Audit Trail > ATNA Questionnaires. For instructions on completing the questionnaire, see pre-Connectathon test 11106. It is important to note that the ATNA Questionnaire build the list of inbound/outbound connections available for your system at its creation and based on your system registration information in Gazelle Test Management. If you modify the AIPOs of your system in TM afterwards, ATNA Questionnaire will no longer be valid. You will have to delete your questionnaire and recreate a new one. Gazelle platform offers its own public key infrastructure: Gazelle PKI. The main use case of this component of GSS is the delivery of signed certificates (and its associated key pair) to all registered participant for a testing session. All theses certificates are issued by a common certification authority (CA), and participant will just have to add this CA to their trust-store. It is the easier way to set up a trusted cluster dedicated to secured connection testing. Out of this cluster, certificates have no value. Also, PKI provide certificates to the TLS simulator that can be used in any other testing purpose. Finally, PKI comes with a certificate validator accessible through the user interface and through a Web Service. In the case of the European connectathon, generated certificates are signed by the IHE Europe certification authority. In the case of the Conformity Assessment sessions, generated certificates are signed by a dedicated certification authority (IHE-EUROPE-CATS; conformity-assessment-testing.ihe-europe.net). Finally, hit the Request button. Then tool administrators are informed and will process it shortly. To retrieve your request and check its status, go to PKI > List Certificate requests. If the request is accepted, the certificate will be generated and signed by the certificate authority of the tool. Finally a notification will be sent to your profile in Gazelle Test Management. You will be able to find the certificate in the list of all certificates PKI > List Certificates, or associated with the request in the list of all requests PKI > List certificate requests. Depending of the configuration of the tool, certificates can also be immediately signed without administration review. Whether it’s the case, you will be redirected to the newly created certificate. Certificates can be downloaded in various format: PEM and DER. The key pair (private and public) of the certificate you have request for is also available in PEM. Note that you can also generate a keystore in p12 and JKS (java keystore) formats. Gazelle PKI tool also embeds a certificate validator. You can thus check the conformity of your certificates against several profiles. Each available validator uses the basic certificate validator first and then validate the certificate against specific rules. Revocation can also be verified. Click on Validate to execute the validation. The result will be displayed on the page. Gazelle Security Suite does not store any validation result. Certificate validation can also be used from EVSClient (https://gazelle.ihe.net/EVSClient/). Certificate validators are filtered by context and are dispatch over the menu. The advandage of using EVSClient is the generation of a validation report and its permanent storage. In each of the tools offered by Gazelle platform, when you use the CAS login link, you are asked to provide your Gazelle TM credentials. In order to bypass the entering of your credentials, you can, in some Internet browser, import a certificate which will be used to silently authenticate yourself. The TLS mode gathers two functionalities: the simulators and the connection testing. While simulators can be used to perform exploratory testing, the connection testing provides a more rigorous environment where test cases are defined and expect specifics results. Client side authentication required or not. Once the simulators are set up, they can be used by any logged user for testing. Running a client is equivalent to send a secured small message on a target, while server is a listening channel for connection attempts. The TLS simulator relies on a dedicated instance of the Gazelle Proxy to intercept messages. It offers a shortcut to validate the message content with EVSClient tool. Each time a connection attempt is done, whatever the client side or server side it is, a secured connection summary is recorded and is added to the connection list. It informs users about the result of the security negotiation (also called handshake). A blue circle indicates the negotiation has succeeded, and a red circle the negotiation has failed. Details on this connection can be displayed for a better understanding. Finally input the targeted host and port of your SUT and click on Start client. The connection attempt will be recorded and displayed below the Start client button. Sometimes connections take a bit more time than expected and are not immediately displayed. In this case, try to refresh the page. Server simulators are permanently listening. To test your SUT acting as a client, you just have to choose one of the available and running servers in the list SSL / TLS > Simulators > Servers, note its IPaddress (or host) and port and send a message to it with your system. Connections will be recorded, go to Access logs or in the View page to list them. In fact, server simulators are just channels that forward the message to a real server. If an answer is expected to your message, pay attention to select a server that forwards to a system that can effectively understand the content of your message. It is usually indicated in the keyword of the simulator. Perform error case scenarios to stress the system under test and get a better trust level. For now, only the systems acting as responder (servers) can run these scenarios. go to SSL / TLS > Testing > Test Cases. You will see the list of available test cases. For each test, a short description presents the goal of the scenario. In the detailed view, all the parameters that will be used during the test and its expected result are summarized. 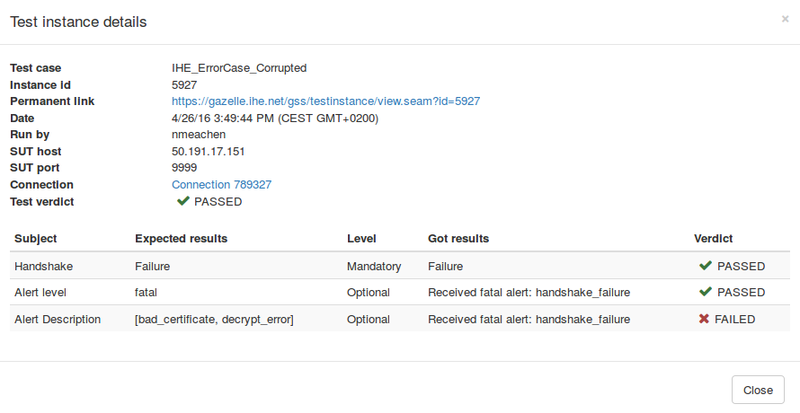 At the bottom of the page, all the test instances are recorded. You can apply filters on the list to help you to find your results. To view the detail of a test run, click on the magnifying glass. To run a test, you must previously add the IHE Europe CA certificate to your trust-store. Finally input the targeted host and port of your SUT and click on Run the test. The test instance will be recorded and displayed below. Sometimes, the TLS Simulator is not initiated and the test instance is marked “NO RUN”. In this case, re-launch the test. The verdict of a test is determined according to 3 sub-verdicts: the handshake verdict, the alert level verdict, and the alert description verdict. Some of these sub-verdicts can be declared as optional while the others are required. To be PASSED, a test must have all its required verdicts to PASSED. In error test cases, the Handshake is usually expected to be FAILED. However it is not the only requirement! The simulator expects to receive a fatal/warning alert or a close_notify from the targeted system. If the connection is closed without receiving those alert messages, the Handshake verdict will be failed. For more information about ending a TLS negotiation and error alerts, see RFC 2246 section 7.2. Audit message specifications created on Gazelle Security Suite are used in EVSClient to validate Audit messages. To create or to edit Audit message specification, go to Audit Trail > Audit message administration. Import specification : one specification or more saved in an archive. When you create an Audit message specification, an unique OID is generated. Then, you have to fill the information about the name, the document reference, the section in the document, the affintiy domain. You have to check the boxes Dicom compatible and Deprecate RFC3881 Validation. By the button in the right side, you can some ActiveParticipant or some ParticipantObjectIdentification. Some ActiveParticipantand ParticipantObjectIdentification are already predefined in the tool. Then, you can save and continue to edit this new Audit message specification. You can add optionality in each element’s attribute. The optionalitycan be M for mandatory, U, C or NA for not applicable. You can also fix the value of the attribute, or use regex to define the expected value of the attribute. You can change the cardinality of the elements expect for the EventIdentification. There is only one EventIdentification in an Audit message. Finally, you can also add extra constraints if needed. The severity of an extra constraint can be : error, warning or info. Specifications created can always be edited. The Syslog Collector is a simulated server used to validate client SYSLOG implementation. Send a SYSLOG message (Audit Message most of the time) to the defined host and port (UDP or TCP depending on your implementation). The status of the Syslog Collector must be “Running”. Find your message and verify there is no validation error. Mostly with IIS servers (Microsoft HTTP server), some resources may be protected. So other a single TLS connection, not authenticated at first, the client request a specific resource (like “GET /secret”). Before responding, server starts a renegotiation of the connection. This was a cause of several security failures, mostly fixed now with TLSv1. The renegotiation asks a certificate to the client for mutual authentication. Even if it is over a single TLS connection, TLS tools record two connections in the logs. The first one is not valid as it is not requesting a certificate, the second one can be valid if it requests for a certificate issued by the CAT certificate authority. Only one client is needed. Once a server it’s created, we can only change its connection parameters (listening port, remote host/port). Being able to build more complex SOAP headers including signed timestamp and errorneous SOAP headers. Currently there is no graphical user interface to create or edit the test cases, everything is done using SQL inserts. the tool allows the creation of ancillary transactions. Then, when running a test, the user will select which transaction to be sent to the system under test. An XML file representing the content of the SOAP body to be included in the final SOAP message. From the XUA > X-Service Provider tests > Test cases page, the user can run a new test (green play icon). The screen is shown below. The summary of the test case is displayed as well as a link to the full definition of the test case. In the configuration panel, the user is asked to enter the URL of the tested endpoint and to select a transaction to send to this system. Finally, the SOAP message is sent when you click on “Launch test”. As a result, the user gets a permanent link to the test instance and the content of the full SOAP envelops of the sent and received messages are displayed. From version 5.7.0, the Gazelle Security Suite tool offers a SOAP web service to validate the digital signatures (ds:Signature where ds stands for http://www.w3.org/2000/09/xmldsig#) present in XML documents. This validator uses the ModelBasedValidatorWS API and thus can be called using the same client as the other model-based validation services. Currently a single descriminator is used: IHE. What does it check ?